Think back to that SNL character who compared all things wonderful, to being like “buttah.” It’s true. Butter is wonderful. And great butter is even wonderfuller. Have you ever followed a recipe for whipped cream, beat the cream for too long, and wound up with butter instead? Well that’s exactly what you’re going to do here, but on purpose. Making butter at home is not necessarily cheaper than buying it. And it’s certainly not easier than buying it. But it beats ordinary butter hands down, in the flavor department. And it really is fun to make. Best of all, people are so impressed with you for doing it. 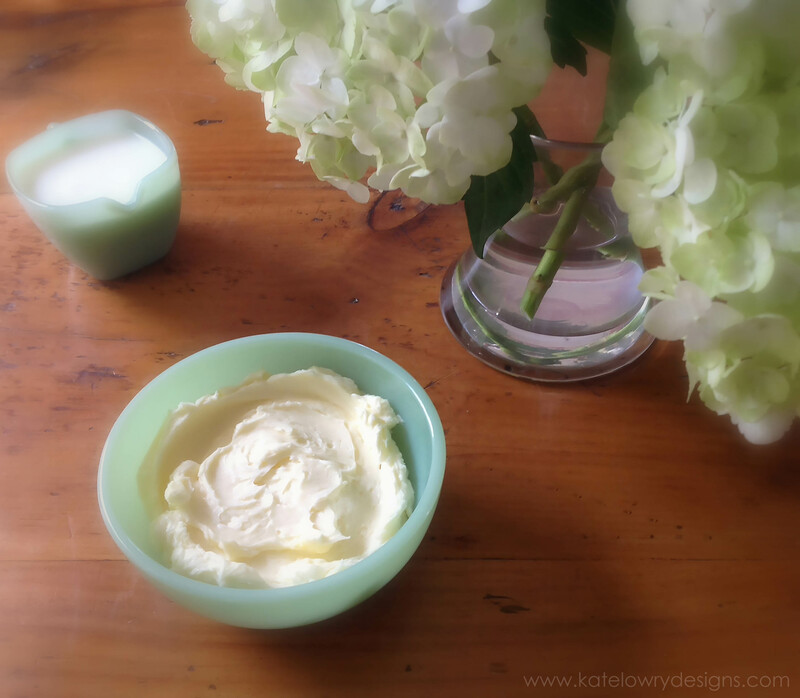 The first time I made butter (and posted about it) someone commented that they were picturing me in a long calico dress and apron, my knees hugging a butter churner….maybe out on the prairie, under the hot sun. Sort of. But replace the calico dress with yoga pants, the hot prairie sun with my climate controlled kitchen, and butter churner with my Cuisinart. So let’s make some butter. You can make it cultured or not, salted or not. This recipe is for cultured, salted butter. Which means what, exactly? Cultured butter is created by adding live cultures (like yogurt) to the cream before churning. You have to let it sit for several hours, unrefrigerated, until it is ready to process (churn). Culturing the cream makes the butter taste tangier because of the lactic acid. It will be more silky and overall richer in flavor. The cultures seem to help digestion, too. And bakers prefer it because the extra acidity results in a terrific crust. 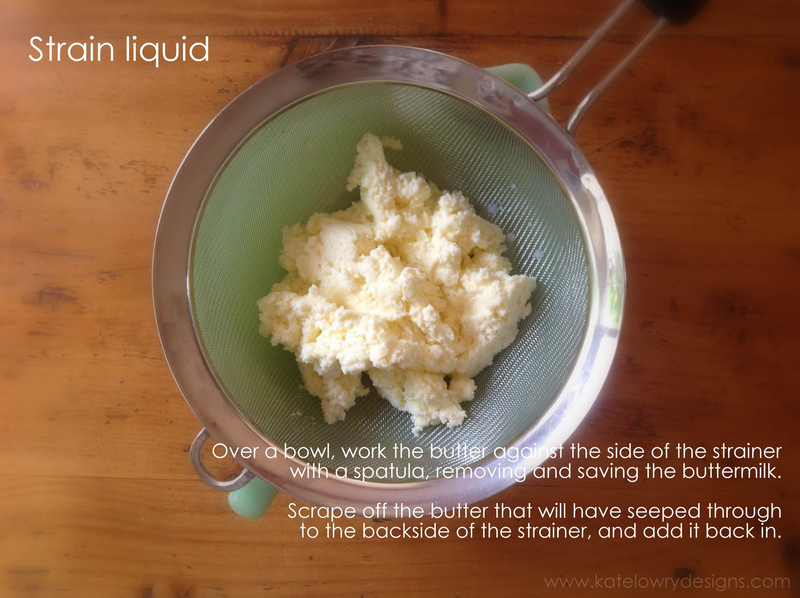 If you want to make this butter not cultured, go right to the Process step. A couple of mixing bowls, rubber spatula, large spoon, clean dishcloth, strainer, food processor, hand mixer, and a salt grinder or mortar and pestle if your salt is anything but fine. When you buy the cream, make sure it is NOT ultra-pasteurized, or you will lose a lot of flavor. Look for pasteurized and homogenized without the “ultra”. Go to your local dairy, Trader Joe’s or Whole Foods. 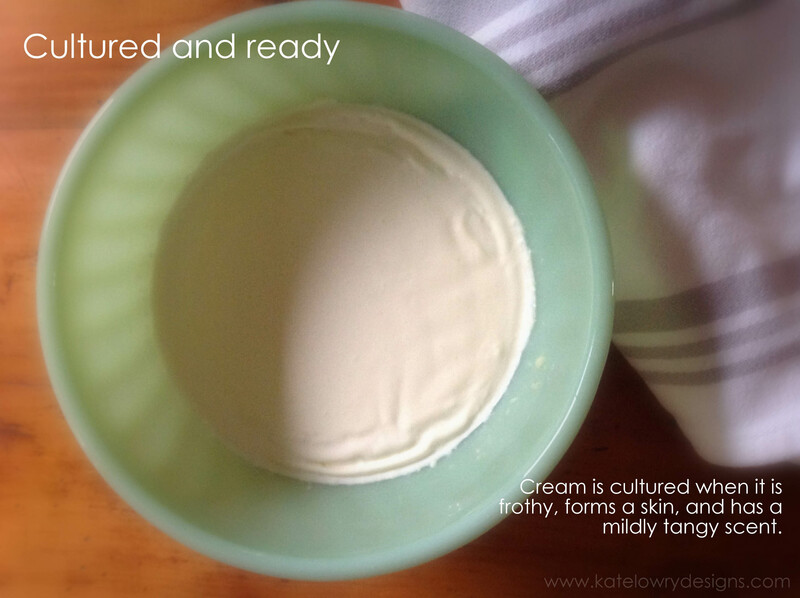 Culture the cream with plain yogurt. Mix together, just enough to combine them. Cover and let sit unrefrigerated for 8-24 hours. It may seem unsafe to leave the cream unrefrigerated. But unless you’re doing this in extremely hot, humid conditions, you should be fine. If the cream has cultured before you are ready to work with it, simply place it in the refrigerator until you are ready. You will know the cream is cultured and ready when it looks frothy and forms a skin on top, much like pudding does. Process the mixture (start here if you chose not to culture it) until it goes past the stage of whipped cream and becomes crumbly, with the liquid completely separated. Strain off the liquid over a bowl by pressing the mixture with the back of a spoon or spatula, against a strainer. 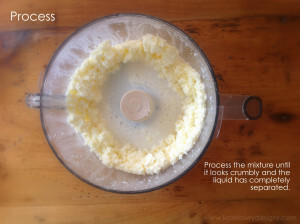 Continue to scoop it up and press again, many times, until you have about one cup of buttermilk in the bowl beneath the strainer. You need to remove as much liquid as possible, to extend the life of the butter. The bonus here, is that you are left with yummy buttermilk for another use. 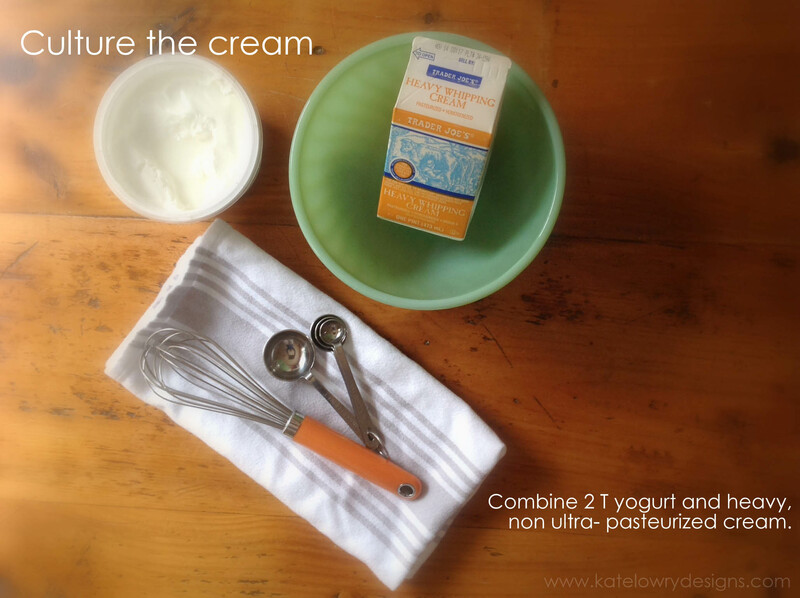 You will want to run the buttermilk through the strainer before containing it. But for now, just put it aside. 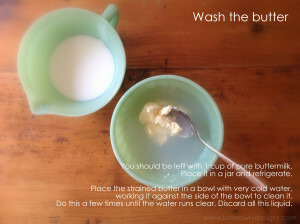 Wash the butter in a bowl, with very cold water, pressing it and working it, like you did when you were straining it. (You will not be keeping any of this liquid. ) Wash the butter several times, replacing the cloudy water until it runs clear. You can let the butter sit on the strainer one more time, for any last drops of water that remain, as you get ready for the next step. 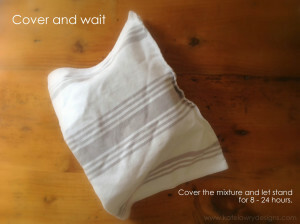 You can use a cloth to squeeze out any more liquid if you want, but personally I don’t bother. 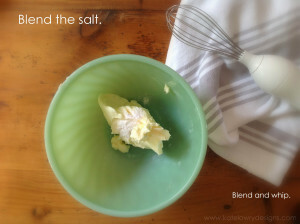 Add salt to the drained, dry, washed butter. 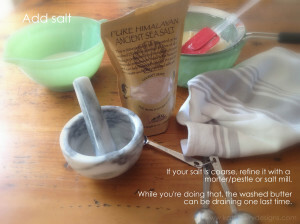 Make sure it is fine salt. Blend the salt into the butter, making sure it’s thoroughly mixed together. Every time you work the butter in the strainer, make sure you salvage all the butter that seeps through to the other side, and add it back in. At the end of the process, you will have creamy, luscious butter and a cup of tangy buttermilk, and you will wonder why you didn’t do this sooner! So what to do with the leftover buttermilk? Why, buttermilk biscuits of course! Preheat oven to 425 degrees. 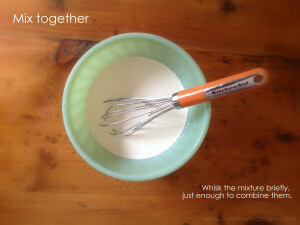 Whisk together the flour, sugar, baking powder, salt and baking soda to blend. With fingertips or pastry cutter, add chilled butter and work it until it looks like coarse meal. Add buttermilk and stir until moistened. Using 1/4 cup dough per biscuit, drop biscuits onto baking sheet, about 2 inches apart. Bake for about 15 minutes or until the tops are golden brown. Cool slightly. 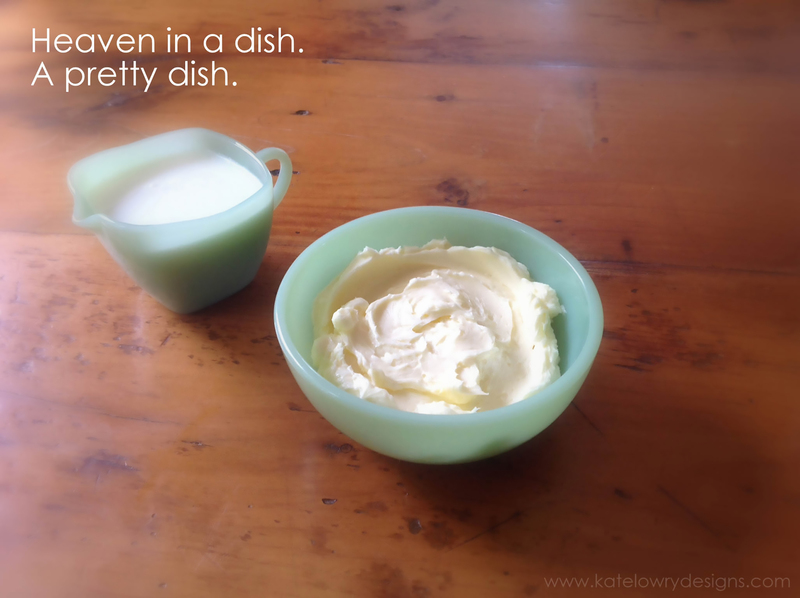 Serve warm with your homemade butter! Yes you can use your homemade butter in the recipe, but if you don’t have a whole lot, use ordinary butter and save the good stuff to spread onto the finished, hot biscuit! Notice that the recipe calls for unsalted butter. If you only have salted butter, don’t worry. You can adjust the salt that the recipe calls for to account for salt in the butter. 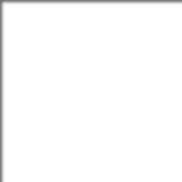 Salted butter usually contains about 1/4 t salt per stick. In this particular recipe, you would reduce the salt by 1/6 t .
ALL PHOTOS ARE THE PROPERTY OF KATE LOWRY DESIGNS, LLC AND MAY NOT BE USED, COPIED OR LIFTED FROM THIS SITE UNDER ANY CIRCUMSTANCES.